Thank you to the lovely Priceless Joy for hosting FFftAW. Maria – Doodles and Scribbles. Kat looked away from Jan, flipping through movies to watch on Netflix but Jan wouldn’t be ignored. “Well, I did go grocery shopping. I know it was my turn, but do we need all that food?” Kat said. Jan considered her friend’s admission.They were both students in the last year of their business degrees and money was tight, but she decided to forgive Kat. Jan hugged Kat and they watched a new movie together, content with their solution. I’m So Sick of Shopping and Fashion! There you have it! I have uttered the words I never thought I would say. I am not just sick of shopping and fashion, I have become a junky. You see there is a certain high you get, a rush of endorphins, from buying that beautiful dress or that fine silk shirt. There is an addiction behind every Pinterest post in Women’s Clothing, to see where that lovely pair of shoes came from. There is an addictive quality to every issue of Instyle that I pour over; I trace that pretty dress back to the website it came from loving its supposed uniqueness. And as I browse through the mall I feel like I have to get something, just a little something – I need that hair spray varnish that makes your hair shine; I need that lace skirt because well it is a-line and that is hard to find in a skirt, plus it’s lace and that is so ‘in’ and so lovely. have had enough of the mall at least. Today walking through the mall I only bought what I needed. I bought bus tickets, stamps, Christmas cards, and hair volumizer because I really did actually need that stuff. I am becoming better at the mall, ignoring Jacob, Banana Republic, Le Chateau, Sephora. It just seems I am always buying stuff and I’m sick of it; yet some things I really do need! And do not get me started on the Internet. On line shopping has become an addiction that I cannot shake. Unlimited or nearly unlimited selection and sizing. Easy returns that include return shipping labels and or free shipping for $50.00. Groupons and Living Socials to Spas – sometimes they save money but let’s face it I’m addicted and bored and when I start not receiving those packages in the mail and deals to the spa; I feel empty – that shopping high fades and I’m left with that empty feeling: what does a girl with health problems, whose ability to work and do physical activity is not very big do? I do not know how I will just stop but I know now after my last order comes in that will be it for the shopping of clothing and accessories; this time I have to break the habit and find that high somewhere else, where I do not know. Writing helps but I used to get that rush of endorphins from exercise so now where? I have these lofty goals you see. To save and pay off my credit card- it’s not too high but high enough! I want to save in tax free savings. Save so in May I can actually spend just a little bit on shopping in Montreal. I need to save for the future. But this shopping addiction is dangerous for me – I just need more things to do, less things that involve browsing the Internet for clothes. It has become a hobby, has always been one and I still want to be fashionable but I want to follow my budget too. I need to learn how to do this now for life. So yes, I hate shopping and fashion, the thorn in my side! But what is really in the balance here besides financial stability is self control; and one must always have self control to some extent. In this case, it is okay for me to buy an outfit once a month, it is not okay for me to do this every week. I feel very disconcerted admitting this. But think of it as an early New Years resolution; but it’s better to just start doing something, than to wait and do more damage. Along with the usual ‘do more exercise’ I will do almost no excess shopping. I’ll buy only what I need and ignore those longings for spring dresses, holiday cuffs that sparkle, and silky lingerie – I love Victoria Secret – but no longer. I have built my dream wardrobe, all the clothes I never could buy before – funny thing is being ill- I often have no place to wear them. Life is ironic. So anything like shopping, you find addictive ( besides drugs) any advice about gaining self control and financial stability? Let me know. Restraint how much do we as people have of it and how hard is it for us to exercise it? 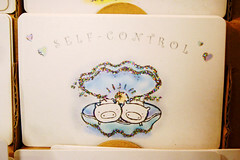 I think in today’s world having self-control is a very hard thing to do. Sometimes restraint can even be a mental disease for example, some of the people on the TLC television show Hoarders and other similar shows. Other times, self-control can be over spending money, eating food, or becoming addicted to electronic devices such as smart phones and the internet. The Merriam-Webster Dictionary online describes ‘Self Control’ as ” restraint exercised over one’s own impulses, emotions, or desires” and I think if we are all truthful to ourselves, in some aspect of our lives we do not show restraint; we do not show self-control. Sometimes it is just easier not to have self-control – to not be responsible for our impulses – it takes discipline. Our “impulses. emotions, [and] desires” can be addictive (MWD. “Self Control”). For instance, I find for myself that practically, most any day I can find some good deal or some item I adore while shopping online or at the store. But when you actually think about it, there is only so many things a person can wear, or tends to wear – because we all have our favorite clothing – and pretty soon too many pieces of clothing sit in the closet and do not get worn; or pieces of clothing get worn once and then put into the ‘Good-Will’ bag. There is something innately exciting about a new out fit or a new pair of shoes, that many people cannot resist. And this goes for people who are not fashion shoppers too. Some men love power – tools, some people love buying things for their house, some people buy expensive cars. But when self – control begins to erode to often credit card bills increase, people get in debt, and our impact on the environment as consumers, is effected. Restraint in what we buy comes down to the fact that as people we must think about what we are buying. We need to ask ourselves, do I really need this? Can I afford this item? How will buying this item effect me and my budget (my families budget)? Will I wear/use this item more than once? What affect will this item have on the environment? Another example of not showing self – control, is people and the amount of food we consume. I can attest to this one as I have been at home the last few years recovering from illness. It is very tempting to eat when you are bored, or if you know something really tasty like triple chocolate brownie’s are just in the kitchen, it is easy to just walk over to the next room and have a second one. Now I am not a major offender in this category, but some people are. Some people choose to mindlessly eat in front of the TV on chips every night. Some people choose not to pick things like fresh fruit and vegetables in their diet; they rely on processed meals full of too much salt and often cholesterol. Choosing not to think when it comes to food affects not only some people’s body weight, but body weight in return can affect a person’s emotional state, confidence in themselves, and future health. Fat is a lot easier to gain than it is to lose. Now showing self – control in what we eat does not mean we do not get treats sometimes, and that we have to give up fatty food altogether. It simply means we show restraint and choose the ‘right’ foods most of the time, and less healthy foods less of the time. It also means that we may (and probably) should exercise and strengthen our bodies so we can eat the food we like, and keep our bodies in good physical condition. But there is also such a thing as over – exercising. Exercising to the point, you are so tired you have to go home and take a 2 hour nap afterwards, or cannot do anything the rest of the night, is also a lack of self – control. It comes down to choosing to think about your diet and exercise routein. We will not always succeed, but at least we should try. A third item, I find it is hard to show restraint with is the amount of time we spend on computers, tablets, and smart phones. At younger and younger ages kids are learning to use Ipads and play on mom and dad’s phones. On the Marilyn Denis Show today they showed a two-year old who was able to flip through and play with certain applications such as his favorite application, Angry Birds on the Ipad. I was in grade 12 when I received my first cell phone – it was a graduation present. Now kids often are receiving phones in jr high, even elementary school. Now this makes it easier for mom and dad to stay in touch with their kids, but it also leads to kids sitting for hours playing their smart devices and not playing outside and not socializing in real life. And an addiction to smart phones etc. happens not only for kids but for adults. Ever left your smart phone at home and felt bereft with out it? Ever just had to go home and get it even though you could have survived the day without it? I just got my first smart phone, and Iphone, this last Christmas. While I was content to just text and make phone calls on my old phone, now I can take notes on my phone, check all my emails, read from the Kobo application, take and make beautiful pictures, listen to my music collection, and do any number of things that I could not do before but strangely I need to do now. This is another example, of losing self-control. We have to show restraint and as much as we like interacting through our electronic devices it is critical that we learn to socialize with each other, to have phone (and other electronic devices) etiquette, and be able to put down our devices to do other things such as going outside, and getting done the chores around the house and office that need to get done, or inviting or going somewhere for dinner; anything where we are actually interacting in real life. So, I am asking you today to work on your self-control in whatever area in life you may have trouble. We all are human and I think it is impossible for us to ever completely have restraint. But if we can discipline ourselves to even change one thing we are obsessed with, I believe we will find it easier to show discipline in other areas of our lives. I know that controlling my food portions sure helped me, and so did learning to say no to certain items at the shopping mall; that really helped my credit card bill drop. Learn to know when to tell yourself ‘no’ it is an invaluable tool in the journey we call life.